If you haven’t noticed in these photos, it snowed and it snowed A LOT! It is officially Winter in Chicago. It has been really cold lately. UGH. The good thing though, even if it’s cold, when it snows it’s so festive and beautiful that it makes it SEEM like it’s warmer. So the snow didn’t bother me too much. Here is another holiday outfit. As much as I love wearing a sequined, metallic, or cocktail dress during the holidays some of those dresses are not appropriate for Christmas Eve mass. Occasionally, my family and I would go to the Christmas Eve mass. I still like to look festive and dressed up and plaid is usually my go-to for a festive and classic style. 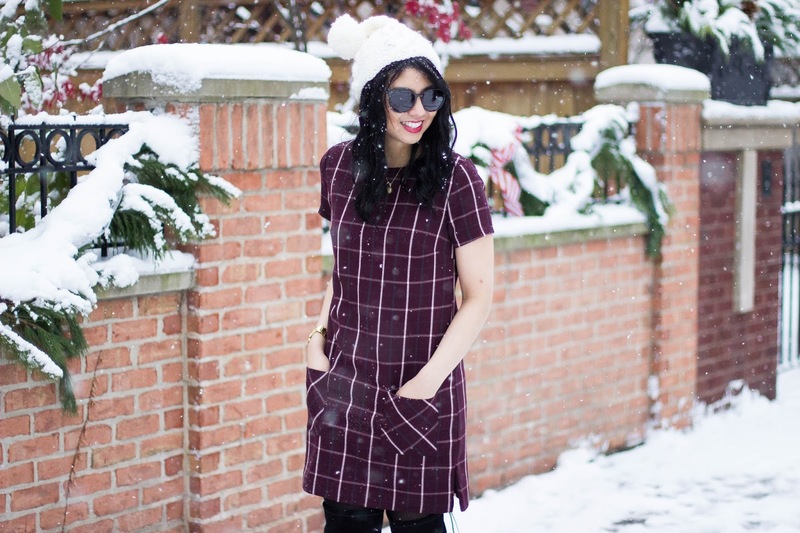 This plaid shift dress is perfect for Christmas Eve mass. It is made with a woven fabric so it has that cozy knit look to it, and the ‘berry’ color is a subtle way to wear Christmas colors. Pom beanies are my favorite winter accessories. They are so cute but they also do an amazing job keeping me warm. I actually wasn’t planning on wearing a beanie for this outfit, but with how quickly the snow was falling, it was making my wig wet and I had to protect it! I actually like how the dress looks with the beanie. It looks more festive. Of course, I won’t be wearing it in the church. Do you guys do/go anywhere special for Christmas Eve? Beautiful look.. The plaid dressdress by Asos has a beautiful design. I so love it. The colour is amazing. Also, the coat is cool too. The snow added beauty to this look if I must confess. So you're freezing here? Hehe! Love the look and your infectious smile! haha since it was snowing it didn't feel too cold! You look super cute in these pirctures. Such a great look! The camel and burgundy are perfect together! I never thought of pairing camel and burgundy together, but it results in a beautiful combination. Also, kudos to you for shooting in the snow, I wouldn't dare! I didn't either until I wore them together in this outfit! Haha it actually felt warmer than usual because of the snow. It is the only reason why I did it! Such a cute dress, girlfriend- love it with that gorgeous camel coat! E mandou muito bem no look. This dress is gorgeous! I love the color and pattern! Looks great with that coat. My gosh, you must have been freezing in the shots without the coat! I love the way you styled this outfit so much. I have Raynaud's syndrome so just seeing the snow in your pictures made me feel so cold! Haha at least it looks festive, like you said! Also I seriously love this outfit, especially that coat! I am in dire need of a camel coat this winter and I stared at yours for ages haha! Haha! I only braved the snow because it usually feels "warmer" when it snows. Thanks for the sweet compliment Deborah! You should definitely invest in a camel coat. It's so worth it! 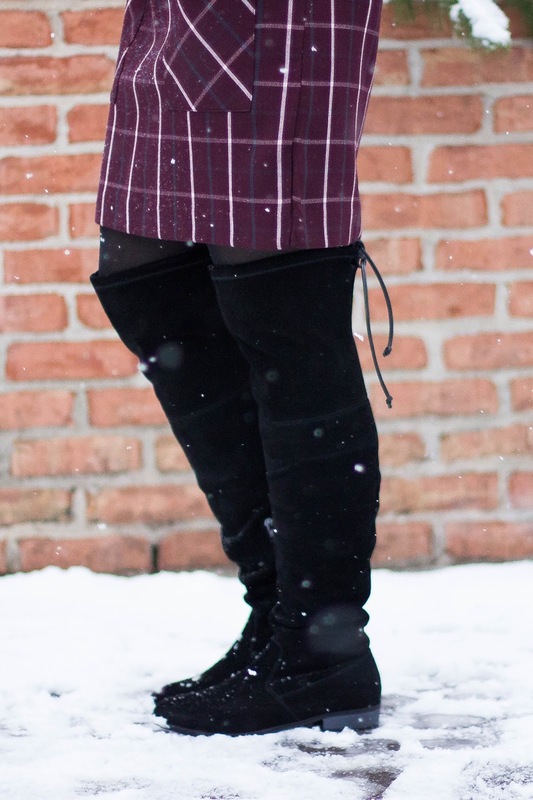 You look lovely in these shots; definitely made the blogger life look easy in the snow! Such a fabulous Asos find!! 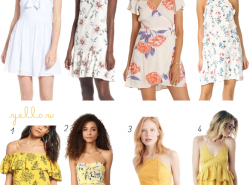 They have THE BEST dresses for the best prices!! They really do! That's why I love Asos! I love the simplicity of this holiday shift dress! It would be perfect to transition from a work day to an after work Christmas party! Have a fab weekend babe! And thanks for answering my collage questions! Thanks Rina! And not a problem! Loving the boots! Actually I love the entire outfit, but I got similar boots from ASOS and they are so comfortable and cute. Are yours velvet? How do you maintain during the winter snow babe? I love berry and plum shades this time of year! They pop so nicely against the snow. You have such a classic Christmas style! I'm lovely these looks! Simple but lovely holiday dress. You look really pretty in it. I also really like you coat.